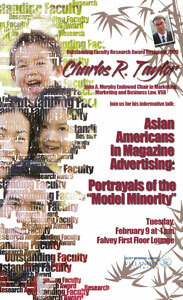 Charles R. Taylor, Ph.D., will discuss the societal and managerial implications of the portrayal of Asian Americans in advertising on Tuesday, Feb. 9 at 1:00 p.m. in Falvey Memorial Library’s first floor lounge. Dr. Taylor received the University Outstanding Faculty Research Award in 2009. According to Dr. Taylor, the Asian American population is often depicted as the “model minority”; they are reflected in advertising as hard-working, technologically-savvy, business-oriented, successful and well-assimilated. While many of these stereotypes appear to be positive on the surface, in reality, some unsettling results can ensue when they are reinforced with the public. This program seeks to deepen society’s understanding of cultivation theory, which states that repeated exposure to a stereotype in the media will lead people who are not members of that group to start expecting the stereotype to be the reality. Dr. Taylor wants his audience to recognize that even though Asian Americans are understudied, their presence in the media should not be limited to technology-based products, business and science magazines, and business settings and relationships. Asian Americans should also be represented in family and social contexts. Dr. Taylor, John A. Murphy Endowed Chair in Marketing and a VSB professor in the department of marketing and business law, has taught at Villanova University for 18 years. He is currently teaching international marketing.